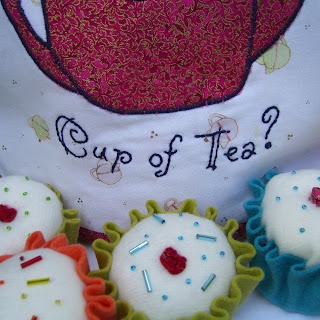 I have been rather obsessed with cupcake and tea thoughts over the weekend and I am very excited that people are signing up for the Cupcake and Tea Swap! I am in the process of trying to create a cotton rabbit pattern that is simple (clean lines) and easy to make - sweet to look at is a desired factor too! Here is version 1 (I'm now working on version 3 - the ears sit up much more now.) I would love to hear your thoughts on what could be improved, changed, tweaked etc ... but for the purpose of the cupcake and tea theme - this little bunny has baked a cupcake for you. 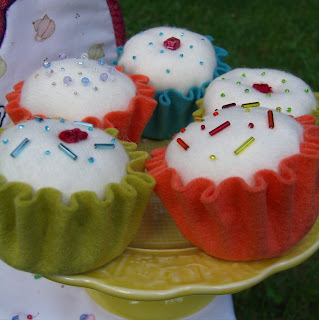 Talking of cupcakes - I recently purchased Warm Fuzzies by Betz White and learnt how to make her adorable cupcakes. The book is rather delicious - although my only frustration is that the needed supply of adorable, soft and beautifully colored wool jumpers is rather on the short side in my little work room. Due to the lack of desired supplies I set about making my own cupcakes ... with scrap material, a circle of felt and the odd bead or two - I'm still refining the pattern for this (they are so easy and quick to make) but I quite like the folded cupcake cup. I also got over excited and made a teapot cosy too - which is odd - as I do not drink tea and do not own a tea pot ... but I felt the urge and Bernie obliged. We are due thunderstorms all day today - which is great for the sunflowers - but it feels like a 'stay inside and knit' day today ... knitted cupcakes perhaps? your cupcake cases are adorable! and I think the rabbit is perfect, will she bring me a cup of tea too please. The rabbit and cupcakes are superb! You really are creative. Thank you for the encouraging words on my blog. I never got on with knitting but I did used to crochet so maybe I should have a dabble with that again and see how I get on. What fabulous cupcakes, they look good enought to eat! The rabbit is adorable too. Your cupcakes and bunny are so cute! I am so looking forward to the cupcake and tea swap. Those cupcakes look brilliant - had you thought of a tutorial? For those of us who are much less inventive? They'd make brilliant pin cushions too. You are a clever Rabbit. Your cupcakes are gorgeous! The frilly cases look perfect. Love the rabbit too. I'd love to be in the Cupcake swap but tried to email you and it wouldn't work, so please can you dropo me a line at catherine@mollycupcakes.co.uk please and we'll sort my details out. Those cupcakes look good enough to eat. You are a very clever girl. I love it - you made such a neat design all yourself! The cupcakes are super cute!! 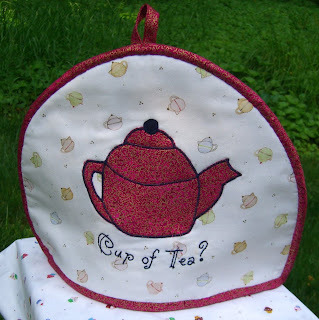 I love the tea cozy too. You are really in a creative mode! Cute! I love how you did the cup variation...it's kind of like the "cutie pie" bowl, isn't it! (only without the felt balls...Good job! Your rabbit is darling. I love the long body and the short arms. So sweet. I love the rabbit as she is for some reason she reminds me of something from one of the Beatrix Potter stories. I've been wanting to get the Betz White book too, but I also don't have a supply of jumpers on hand. 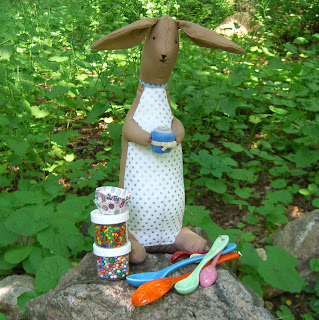 I absolutely love your rabbit - so sweet looking (as are the cakes!). Aren't the Betz White cupcakes fabulous? I have the book but haven't been able to get my felting to work properly yet. I got a bit disheartened and gave up actually. I will get back to it at some stage though. I love your other cupcakes too. They are fantastic. You should definitely do a tutorial for us. I am really excited about the swap. I already have designs going around in my head. 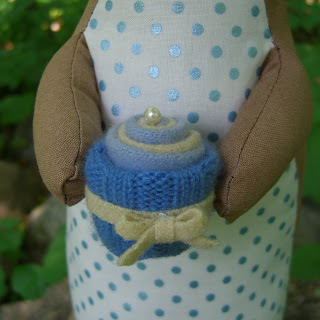 that bunny is just perfect as she is, as if just out of a storybook page - your cupcakes are gorgeous too - funnily enough I just made a bear called Cupcake! I'll have to have a go at making a cupcake. I LOVE your new rabbit! I esp. like the fabric on his belly - so cute!